Summer is (almost) over, and many of us are looking at a busy period of work, studies and responsibilities. Even just thinking about them is enough to get us a little stressed out! Luckily, there are plenty of easy, relaxing and calming yoga poses to counterbalance the busy periods. These poses will calm your sympathetic nervous system (responsible for the fight or flight reaction), and get you from a feeling of stress into a feeling of calm in no time. Keeping stress at bay has many useful benefits: you will sleep better, your digestion will work optimally and you will be in a brighter mood in general. Try these great beginner-friendly poses that will have you feeling relaxed in no time! Child's pose is a great pose to start with. It will allow you to relax your body while turning your gaze inward. Take a few moments in this pose, breathing in deeply, allowing all the weight of the world to wash off you. This simple pose is not only relaxing and soothing, it gives a gentle stretch on the hips, thighs and ankles too, while elongating the back. Modifications to try: Bring your knees further apart, this will give you more space for your belly. Stretch your arms from side to side to give your back a more intense stretch, or fold your arms and place your forehead on your hands. You can also use a block under your forehead. Place a bolster under your torso for more support and comfort for the upper body. This easy pose is a great stress reliever, your feet (and your body) will thank you for this. Since it is a mild inversion, it will drain lymphatic fluids from your legs, reducing swelling in the feet, ankles, and knees. At the same time, it increases the circulation in the upper body and brings back the balance after spending a long time on your feet. Simply sit close to a wall, bring your buttocks as close to the wall as possible, and lift your legs up. Modifications to try: With any discomfort on the lower back, bring your sitting bones a bit further from the wall. Make sure your knees are not locking. You can also place a blanket or a bolster underneath your hips to increase the inversion. If you have enough space on the wall, drop your legs to a V shape to stretch the inner thighs as well. This pose will give you a deep sensation of calm and it will relax your entire body. While providing a hip opening and a stretch for the inner thighs, this pose will also give you a gentle heart opening. Staying anywhere from 5-15 minutes will calm your central nervous system and increase your blood circulation. Learn how to do Reclined Bound Angle pose here. Modifications to try: Try a bolster under your back (lengthwise), you can even place some blocks under your bolster to be able to sit a bit higher. If you feel any discomfort in the knees, you can place blocks under your knees for support. You could also try this on the wall, right after Viparita Karani. Just bring the soles of your feet together and lower your feet closer to your hips. Yoga twists release tension in the spine and they restore the balance in the nervous system. The Revolved Abdomen pose is simple, and it will give you great benefits in relieving stress, anxiety, it helps with fatigue and headaches. This pose also provides a good opening and stretch for your shoulders, upper back and neck, it stretches the back muscles and glutes and massages the inner organs. Modifications to try: If you feel discomfort in the shoulders or tingling in the arms, keep your arms closer to your body. Placing your knees closer to your chest will intensify the twist in the upper back. Moving your knees further down will move the twist to the lumbar area. Experiment what feels best for your body. With back injuries, move very carefully in the guidance of a yoga instructor, or avoid the pose altogether. You can find more tips on how to safe in twists here. It can be challenging to do nothing, especially when we feel stressed. But this is exactly why Savasana is an important pose to include in your practice. At first glance it may seem like nothing at all—just laying on the mat, but the trick is in its sweet nothingness, space, the allowing and the release that it gives us. 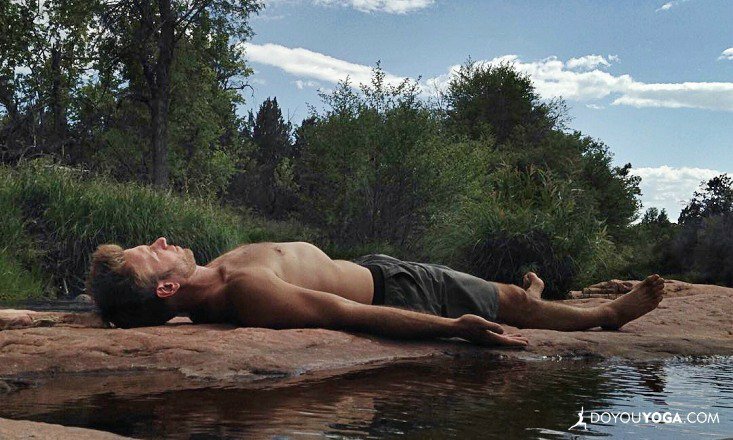 Try to end your practice every time with at least five minutes of Savasana. Modifications to try: Get comfy! Place a pillow or a bolster under your knees, cover yourself with a blanket, place a bolster on your belly for weight, cover your eyes with a small towel—anything to pamper yourself and to allow yourself the maximum relaxation. Stress and anxiety is stored in the muscles, and the more we can relax the body, the clearer message the mind will get that everything is actually pretty OK. Try these easy, beginner-friendly yoga poses that effectively relieve stress whenever you feel you need some calming down, and enjoy the benefits! What is your favorite yoga pose for stress relief?